Patrick Comerford: ‘Everyone serves the good wine first’ … or do they? wine first’ … or do they? This morning, our readings continue the great themes of Epiphany, exploring those moments of sudden and striking realisation that in Christ God is present among us on earth, in our daily lives. ● The Wedding at Cana (John 2: 1-11). In each of these three events, Christ is manifest as God-incarnate at a point that marks the beginning of his ministry or his presence among us. It is the moment when we are caught off guard as we realise that this seemingly helpless new-born child, or this one among many in the stream of visitors to Saint John the Baptist at the River Jordan, or this anonymous guest who is one among many at a small-town wedding, is in fact the omnipotent God, the one through all things are made, the King and Ruler of the universe. There are many reasons why I enjoy returning to his morning’s Gospel reading again and again. It is one of my favourite passages for weddings, because it talks about how families are made and shaped, and asks us to think again about how we cannot shape or control our own families. We cannot decide or control who is going to be an uncle or aunt by marriage to our children or grandchildren. And if we cannot control relationships like that, then, in the same way, we should rejoice in diversity, variety and pluralism in the Church and in Society. I find too that this passage is a good reminder that Christ is truly God and truly human. Chapter 1 of Saint John’s Gospel introduces us to a new creation, a new creation that is in Christ. Then, there are six days in this new creation, and this reading brings us to Day Seven. What did God do on the Seventh Day in the creation story? God rested. And now that we have arrived at Day Seven in the Saint John’s Gospel, we come to the Day that Christ rests with his disciples, and to a foretaste of the Heavenly Banquet, which is the completion of God’s creation. 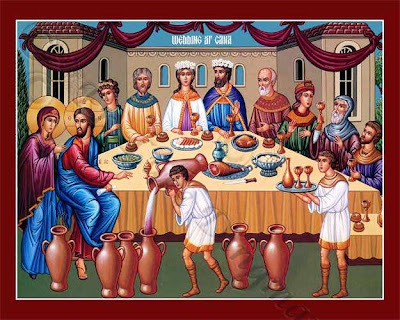 ‘Blessed are those who are invited to the marriage supper of the Lamb’ (Revelation 19: 9). Christ rests as God on the seventh day, and Christ rests in a very human way on the seventh day: an Epiphany experience in the truest sense. This is also the story of the first of the Seven Signs in Saint John’s Gospel, and the first of the seven signs comes on the seventh of the seven days that introduce the Gospel. But there is another way in which this Gospel story should reach our emotions and into our hearts. Jesus orders the servants to fill the empty containers with water and to draw out some and take it to the chief waiter. After tasting the water that had become wine, and not knowing what Christ has done, he remarks to the bridegroom that he has departed from the custom of serving the best wine first by serving it last. Certainly, for Mary, she takes action immediately. You can just picture her as the concerned aunt, like so many aunts at a wedding, not wanting her nephew and his new wife, or her niece and her new husband, to be embarrassed. Did you notice that Mary does not make a request here? She simply observes or passes comment on a matter of fact in her conversation with her son. They have no wine. She is not asking for a miracle. She accepts whatever her Son may say, even if it is not going to turn out to be what she expected. What did she know at this stage? What did she think her Son could say or would do? But, whatever about Mary’s embarrassment, this is not an embarrassing moment for Jesus. Jesus says his time, his ‘hour has not yet come’ (verse 4). So, why does he seem to change his mind, and do something that means that this wedding is not going to crash into disaster? 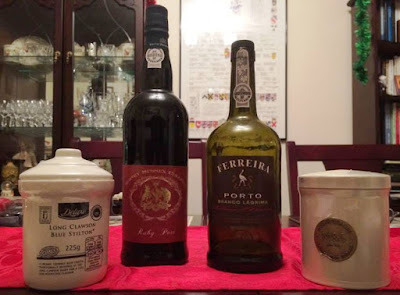 Wine fraud is one of the oldest frauds in the world. Perhaps the finger of suspicion points at the chief steward, the master of the feast. Does he not realise what is going on? Did he not buy all the wine that he had charged up to the couple getting married or their parents? Has he, perhaps, been siphoning off the wine? We know this is not so. At some dinners, people may mark the end of the celebrations with a good port. At weddings, we often hold off on serving the good wine, so that the champagne is there to toast the bride and groom later on. The steward never even asks where this good wine comes from. He just accepts that it is there. Perhaps he suspects he has been caught out. The steward shifts responsibility to the bridegroom. But the truth is that the good wine has been kept until now. Now the best of God’s promises are about to be fulfilled. The six stone jars contain water for rites of purification. They are ceremonial rites, not hygienic rites – they are not drinking water, but more like the waters of Baptism. Each jar contained 20 or 30 gallons, so we are talking about 180 gallons of wine – roughly speaking, in today’s terms, 1,091 bottles of wine. And because the wine was so good (see 9-10) in those days, it had to have water added to it, so this may have doubled the amount –perhaps up to 1,500 or 2,000 bottles of wine by today’s reckoning. It was enough to ensure they partied for days … and weddings in the Eastern Mediterranean do go on for days. This is not just after the seventh day in a new creation, but we are told that in another cycle it has become the third day. Anyone listening to this Gospel soon after it was written would immediately associate the third day with the Resurrection. And the good news is that on third day Christ is Risen, that we are all invited to the banquet. So, what are we to take away from this morning’s Gospel story? 1, The Christ revealed to us at Epiphany time is truly human and truly divine. 2, In Christ there is a new creation – the best is yet to come. 3, In our obedience to Christ we find that he takes away all our embarrassments – if you like, he saves us from all that is sinful. 4, God’s generosity to us in Christ is over-generous, God’s love for us in Christ is over-abundant, God’s goodness to us is the best, is beyond measure, is beyond our imagination. 5, God in Christ calls us all to join him in the waters of baptism and to feast with him at the Heavenly Banquet.